Deadpool3310 4 months, 3 weeks ago. If you like the ROM then consider the efforts of the developer(s) and you can make a donation. THIS IS AN INITIAL BUILD WHICH MAY NOT BOOT AT ALL. HAVE A BACKUP BEFORE FLASHING THIS AND TRY AT YOUR OWN RISK. Installing a custom ROM on a Galaxy S5 Mini (kminilte) may require the bootloader to be unlocked on the Galaxy S5 Mini (kminilte) phone, which may VOID your warranty and may delete all your data. Before proceeding further you may consider backup all data on the phone. You are the only person doing changes to your phone and I cannot be held responsible for the mistakes done by you. – Here is theTWRP update guide for the Galaxy S5 Mini (kminilte). This TWRP recovery guide may require an unlocked bootloader on the Galaxy S5 Mini (kminilte). If there is no in-built ROOT or it does not work for some reason then you can try flashing SuperSU zip using recovery or else install the CF auto root for Galaxy S5 Mini: http://download.chainfire.eu/523/CF-Root1/CF-Auto-Root/CF-Auto-Root-kminilte-kminiltexx-smg800f.zip?retrieve_file=1 to gain ROOT access. Download and Copy the GApps and Galaxy S5 Mini LineageOS 14.1 ROM ZIP to your phone. First flash the Galaxy S5 Mini LineageOS 14.1 ROM ZIP from device. Then flash the GApps zip from your device memory. Reboot and Enjoy the Nougat 7.1 Lineage OS 14.1 ROM for Galaxy S5 Mini (kminilte). 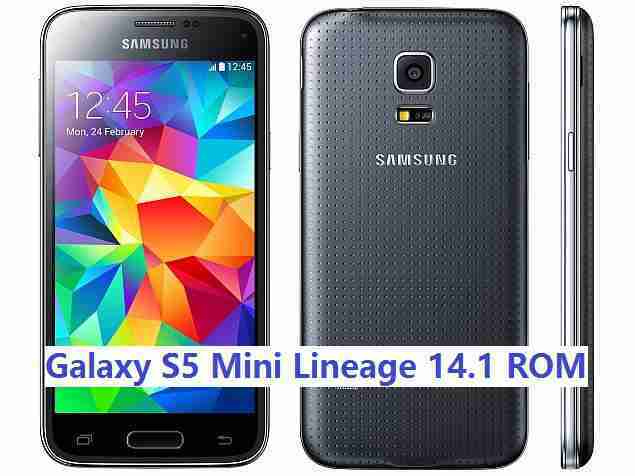 Copy the latest Galaxy S5 Mini Lineage OS 14.1 ROM ZIP file to your phone. Stay tuned or Subscribe to the Galaxy S5 Mini (kminilte) forum For other Android Nougat ROMs, Lineage OS 14.1 ROMs, other ROMs and all other device specific topics. 1) The LineageOS super user add-on addonsu-arm-signed.zip does not install; the installation procedure aborts with some error message that looks SELinux-related. I tried flashing SuperSU, too, which succeeded bit still gave me no working su binary. As it seems now, the only way to work as superuser on the device is via “adb shell”, which does support root access (after enabling it in the developer settings). 2) Any attempt to configure my providers call forwarding invariably crashed the system. It makes no difference whether I dial codes like ##21# or #21# manually or whether I try to accomplish the same thing through the preferences menu in the dialer. So there’s clearly some issues in the interaction with the modem, which is reminiscent of previous versions that used to have all kinds of problems providing reliable calls. Anyhow, the ROM is working really nicely otherwise (if you don’t need super user access). Can I install it for my G800H kmini3g? The new 14.1-20170528 build is broken. I’ve made several attempts to flash my phone with that image and it invariably aborted trying to set some unsupported SELinux context at /system/lost+found. Wiping all data partitions and caches etc. made no difference. I have updated few more builds from other developers. All other builds seems to be very recent and may have more BUGS. If you are interested you can try all of them to see which one is more stable?? Thank you very much for your efforts, @shibaa987. I tried the latest build from @hennymcc, lineage-14.1-20170602-UNOFFICIAL-kminilte, and I can confirm that it works great on my phone. I flashed it together with open_gapps-arm-7.1-nano-20170608 without any problems. I probably won’t have a chance to try the other builds since I depend on a working device, unfortunately, and have only so much time to spare for testing efforts. If I do get a chance to try any of the other builds then I’ll provide feedback here. Thank you very much for your efforts, @shibaa987. I tried the latest build from @hennymcc, lineage-14.1-20170602-UNOFFICIAL-kminilte, and I can confirm that it works great on my phone. If it works fine on your phone it is great. I told you to try the other builds iff hennymcc’s build would not have worked. As you have a working build, I guess no need to test further :). I have tried several combinations of different ROMS with different GApps versions. Some don’t detect my SIM card and others present “Setup Wizard Fail” after initiating. Has anyone had the same problem? If so, how did you solve it?